Much as humankind has been fascinated by the exploration of outer space, it has also been mesmerized by the complexity of the brain. Over the years, scientists have explored intricate neural connections, seeking to uncover how a 1.5-kilogram lump of protein is able to achieve things like processing enormous amounts of information and creating various forms of art. 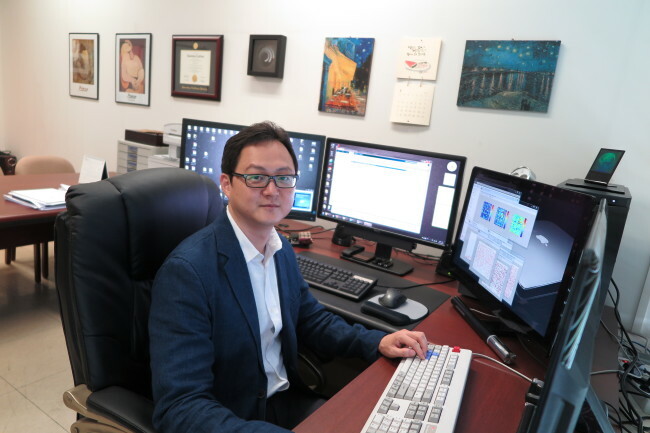 Paik Se-bum, an assistant professor at Korea Advanced Institute of Science and Technology, is one of the budding researchers in the relatively novel but increasingly important field of brain engineering. His research centers on the brain’s processing of sensory information, specifically the functional organization of the neural networks in the visual system. “It (the research) is about understanding how the sensory system processes the visual or audio information obtained via the eyes or ears, and how it prompts us to take necessary reactions,” Paik explained. “To do this, we create a model sensory system and do a computer simulation. Or we analyze the existing data from animal testing and make a new model, which helps us predict the results of the actual experiment. Computational simulations and psychophysical experiments are both used to overcome the obstacles in conventional brain studies. The exponential progress of computer technology has made it possible to perform realistic computer simulations of the complicated neural networks, according to Paik. Computer programs allow researchers to simulate what is going on in the neural networks when information is obtained via the visual system. Paik is currently studying the neurons’ interactions with each other, how they affect the structure of functional maps and their responses to visual stimuli. “From now on, the importance of theoretical modeling and computational simulations will play an increasingly important role. Unfortunately, theoretical research accounts for a relatively small proportion compared to experiments (in brain studies) and its importance is not well understood,” Paik said. According to Paik, theoretical research allows scientists to predict new phenomena in the field and to explore brain functions that are hard to simulate through actual tests, supplementing the limitations of the test methods. Paik said his academic background in physics has helped him understand the complicated systems of the brain. The field of brain engineering requires expertise in various fields including math and biology, especially neuroscience. “The main focus is to analyze the system which is the human brain. This means analytical ability, especially mathematical analysis, is crucial for a researcher,” he said. Brain research is a complicated process due to the large number of constituent neurons. Being an up-and-coming researcher can have its shortcomings. Paik said that some scholars tend to have difficulty accepting results that are not in keeping with conventional beliefs. “In 2011, my paper on functional maps in the visual cortex was published in Nature Neuroscience and it went against the existing theories. The proponents of those theories took issue with my paper, some even resorting to illogical claims to discredit my work,” he said. Paik responded by logically refuting their claims and publishing new papers. He emphasized the importance of his field, saying it can extend beyond the lab. The findings can be used for medical and technical applications, Paik said. He pointed out that once they understand the functional structure of the visual system, the knowledge can be applied to various brain-related technologies. An example of such an application involves artificial intelligence for vision, which can enhance the current technology related to visual recognition such as through motion perception algorithms. Ultimately, understanding the visual system can contribute to our understanding of the human brain itself, he said. Paik still has a long way to go in navigating the complexity of the brain. But the researcher said he welcomes the long, winding road ahead of him. “My hope is to spend my entire life researching to find out more about the undiscovered truth,” he said. Paik, currently in charge of the Visual System Neural Network Lab at KAIST, received a Ph.D. in physics at the University of California at Berkeley after receiving his master’s degree at Seoul National University. He was selected for the TJ Park Science Fellowship in 2013.